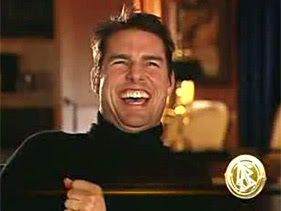 and Tom Cat - Unmasked , a video spoof of the Scientology video @ Lolcats ‘n’ Funny Pictures / I Can Has Cheezburger?, in which Tom Cruise is a cat and speaking LOCcat. "However shady Scientology may be, Morton’s language in “Tom Cruise: An Unauthorized Biography” is extreme. He and his sources compare the church and its leadership to fascists, the Roman Empire, storm troopers, Machiavelli, Orwell’s “Animal Farm,” Napoleon, Stalinists and North Korea. He also repeatedly invokes Nazism, and quotes without censure the German Protestant Church’s comparison of Cruise to Joseph Goebbels. Even if everything Morton says about Scientologists were true — that they make certain members have abortions, that they run around with Uzis and boxes of cash, that they threaten recruiters with torture if they don’t land celebrities — it doesn’t out-corrupt, say, the early Mormon Church as depicted in Fawn Brodie’s “No Man Knows My History.” And unlike “Tom Cruise,” that book managed to make its subject, Joseph Smith, seem three-dimensional even as it eviscerated his faith." Its not all gloomy for the Church - Will Smith recently became a Scientologist - nooo!! Read the article. It doesn't say he became a scientologist. He says he thinks scientology is 98% the same as all other world religions. Never says he's one of them.